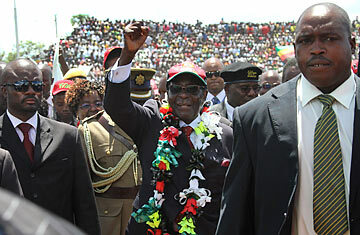 Zimbabwean President Robert Mugabe, center, greets the crowd as he arrives for his 88th birthday celebrations in Mutare, Zimbabwe, Feb. 25, 2012. Human rights campaigners are warning of rising repression in Zimbabwe as 88-year-old President Robert Mugabe pushes for another election to further extend his 32 years in power, despite being seriously ill with prostate cancer. "We have grave concerns about the recent increase in political repression," says Human Rights Watch Africa deputy director Leslie Lefkow. "In the past year, authorities aligned with Zanu-PF [Mugabe's Zimbabwe African National Union-Patriotic Front] have intensified attacks against human rights defenders, journalists, and officials and members of the MDC [Movement for Democratic Change, led by Morgan Tsvangirai]." Rights campaigner Paul Chizuze disappeared from the country's second-largest city, Bulawayo, last month. Supporters believe he was abducted, possibly killed, by security forces loyal to Mugabe. Scores of aid groups have also been banned this year, accused of pushing a Western political agenda, while hundreds of protesters have been detained. The latest example of Zanu-PF's clamp down is the sentencing on Thursday of six Zimbabweans to two-year suspended jail terms, $500 fines and community service for watching a documentary about the Arab Spring  evidence, the state prosecutor claimed, that they were plotting to overthrow the regime. "These politically motivated prosecutions do not bode well for free and fair elections in Zimbabwe," says Lefkow. Dewa Mavhinga, acting director of the Crisis in Zimbabwe Coalition, a network of more than 350 civil society organizations, condemns what he describes as the "systematic closing down of democratic spaces," adding: "We are alarmed by the sharp deterioration in the human rights situation." The country is not ready for an election, he says, since "the political playing field is not level." Noting Mugabe's allies still control state institutions like the electoral commission, the judiciary, the police and army, he continues: "We expect Zanu-PF to try to rig votes, and if that fails, resort to violence." That concern is widely shared. "Security issues threaten to undermine free and fair elections as well as meaningful reform," says Percy Makombe, Zimbabwe Program Officer at the Open Society Initiative of Southern Africa. The Zimbabwean newspaper, The Standard, reported this month that Mugabe wanted elections this year, perhaps as early as June. A further sign that an election might be approaching is Mugabe's new economic indigenization program, which forces foreign companies to hand over 51% of their shares to black Zimbabweans. The scheme seems likely only to benefit the Zanu-PF elite but is being sold to voters as something that will lift all Zimbabweans. Tsvangirai's MDC objects to any election before a new constitution is agreed. (The current one reserves wide powers for the President.) The MDC and Zanu-PDF have been negotiating over reform since they formed a coalition government in early 2009 but have come to no agreement. The experience has damaged the MDC and robbed it of much momentum. MDC support has been further eroded by corruption scandals involving party members. Mugabe surprised Zimbabweans by offering to form a government with the MDC after an election in 2008 during which Mugabe's unleashed a wave of violence against the then opposition, killing more than 100 MDC members and forcing Tsvangirai to withdraw from the ballot. The reason? Zimbabwe was spiraling in hyper-inflation, the government was all but bankrupt and Mugabe saw power-sharing with the MDC as a way to improve foreign investor sentiment and right the economy. At the same time, however, the regime discovered it was sitting on one of the world's biggest diamond fields near Marange in eastern Zimbabwe, with a potential annual output worth several billion dollars. Mugabe's army and police quickly seized control of the area under the direction of the Zanu-PF elite and, with money no longer a problem, Mugabe now wants out of the coalition and a return to one-man rule. "Corruption among top political leadership is rampant," says Mavhhinga. "Marange revenue is lining the pockets of few individuals, while the country remains poor." This month, MDC finance minister Tendai Biti complained the treasury only received a quarter of the $77.5 million it had projected as its share of diamond sales this year. Meanwhile in January, Zanu-PF threw Mugabe a $1 million birthday party. While any election would be important, just as critical is the question of who will succeed Mugabe when he dies. Last August, one of the two men considered as a frontrunner to take over from Mugabe, ex-military chief Solomon Mujuru, married to Vice President Joyce Mujuru, was found dead after a fire at his farm outside Harare. His widow insists he was murdered. By whom, however, is a mystery.